This book is the most up to date and relevant material on this very interesting topic. 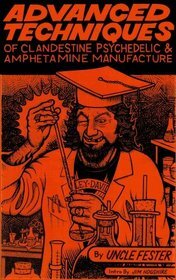 From Uncle Fester himself: I begin this new second edition with updated scams and schemes for obtaining chemicals, and move onto the latest techniques for extracting ephedrine or pseudoephedrine from pills or herbal ephedra. Then the book really shifts into high gear as I detail a series of new and high yielding meth recipes which don't require obtaining difficult materials such as iodine, red P, or anhydrous ammonia. These new methods are all easily supplied off the hardware store shelves. I follow this with an examination of the use of the amino acid phenylalanine, found off the shelf at health food stores, as an alternative starting material rather than using ephedrine or pseudoephedrine. Finally, Mr. X writes from the federal pen detailing the mistakes his fellow inmates made which landed them in their regrettable situation. This book is the most up to date and relevant material on this very interesting topic.